The Olympus 45mm f1.8 is a superb value for money lens at just over £200 pounds I would really recommend it. Street photography is all about capturing a unique moment. The Olympus camera as a real gem, it has a blazing fast AF and I find the controls very intuitive. It’s small and light but feels strong and really well built. A “caught” portrait is halfway between a candid and an “asked” portrait. They make for great photos if you can catch the person’s attention at the right moment. I found myself using both the viewfinder and the back screen, dependent on how much time I had to grab the shot. As the Olympus 12mm f2 is pretty wide, I had to get in quite close, sometimes I would just point and shoot without using the EVF or the back screen, it doesn’t always work, but now and again you can obtain a half decent shot. Being a bit shy, I am still finding the idea of approaching random strangers in the street a bit scary and hope soon I will have gained a bit more self-confidence to start approaching people. For the moment, I am taking candid shots with the exception of street entertainers who seem to be used to having their photos taken. The Olympus OM-D EM-5 is great tool because you can take blazingly fast shots without attracting too much attention to yourself. 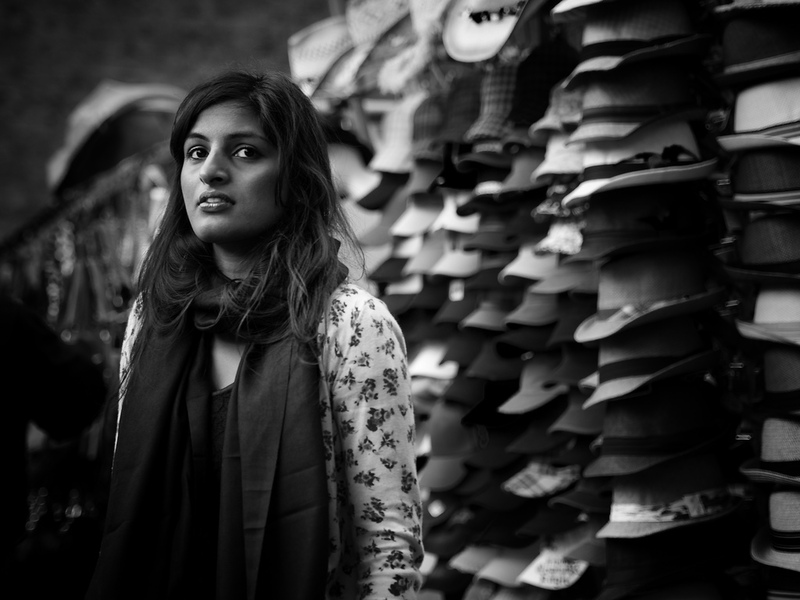 A wide angle lens is great for street photography if you can get close enough, but it can distort faces. The Market Walk offers a brilliant opportunity to see London life at its best, there is so much variety and subject matter to shoot, if you are like me the time will fly by and you will undoubtedly be back for more. I have already made a 2nd trip and am shortly planning to do another, this time I am considering setting myself a goal of approaching at least one stranger and asking for a shot! 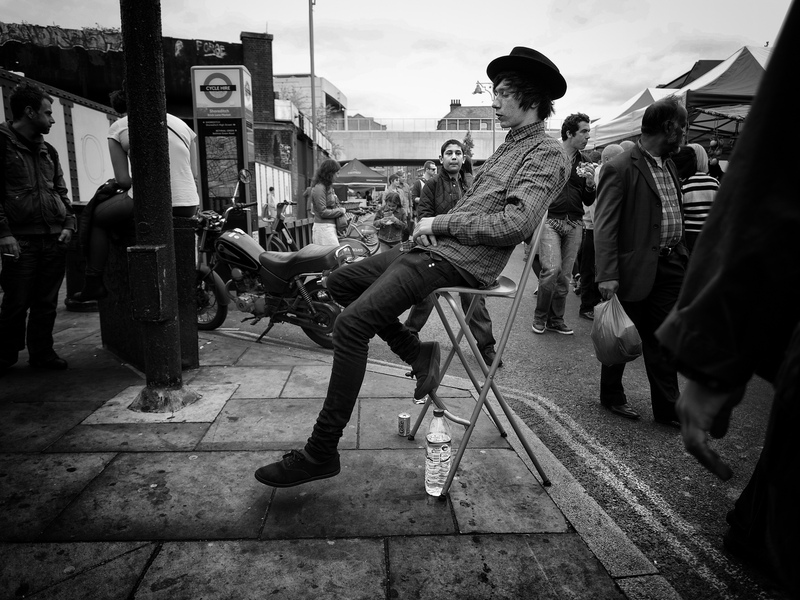 Reading other photographer’s blogs and the London Street Photo site gave me the kick I needed, it has awakened an irresistible urge to capture life on the street. 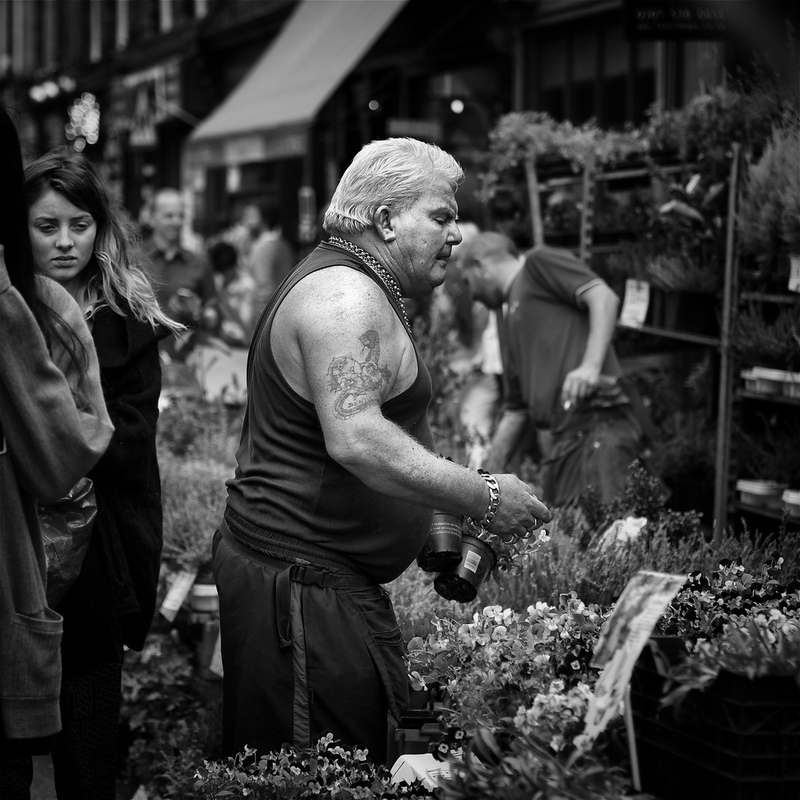 You can check out Simon’s other street photos from around East London Markets on Flickr. 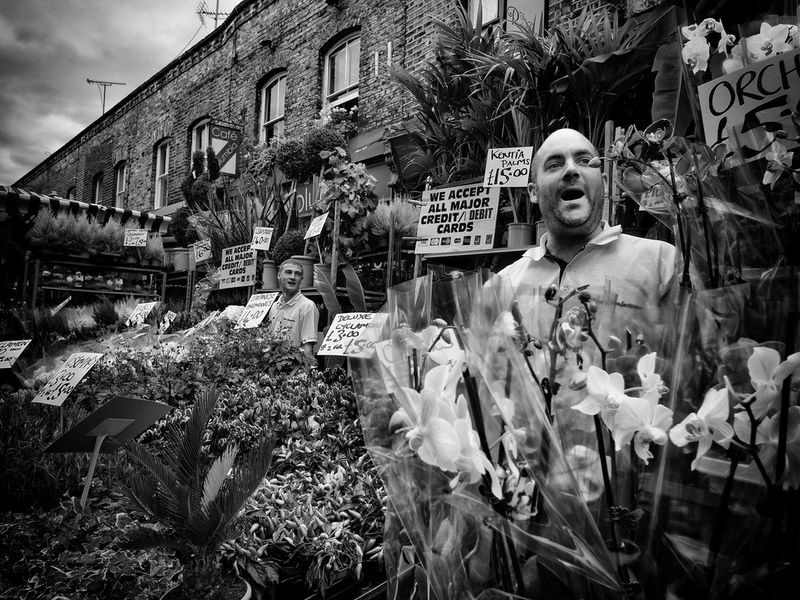 This entry was posted in Photography and tagged Columbia Road Flower Market, Olympus, OMD by Peter Thomson. Bookmark the permalink. Do you or have you used the Panasonic GX1? How would you compare it to the Olympus? I love the GX1 but the battery life really frustrates me. The battery life on either of these cameras will be similar because they are driving similar internals. Although in theory the image stabilisation in the OMD would use more battery. In practise, the best step would be to grab a spare battery for the GX1. I have the same problem with the GF2 when street shooting in foreign cities.